While living in the Lowcountry is idyllic, the area is also prone to hurricanes and tropical storms. So, when we want to bring in the light and warmth of a sunroom, considering storm protection becomes a necessity. Your sunroom becomes especially vulnerable first and foremost because of the sheer multitude of windows that are susceptible to strong winds and airborne debris. Photo by Elizabeth Taylor Satterfield Interior Design, Inc. Whether you are building, remodeling or adding to your sunroom, one of your primary concerns should be protecting your investment against storm damage. With the Lowcountry having its fair share of storms, finding what you need to protect your home is easy. 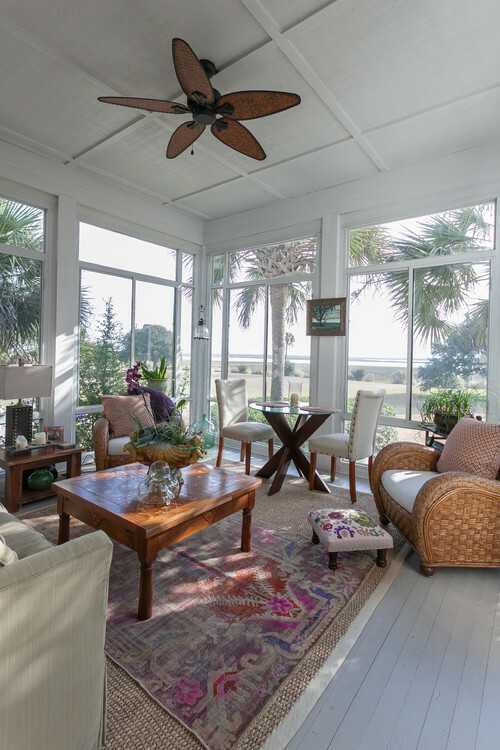 Impact Rated Windows are the best choice for Lowcountry homes. Whether installing windows in a new sunroom or selecting replacement windows your contractor and your window specialists know that your windows must meet stringent building codes. When it comes to a window installation, there is also the option to include storm stud protection. If window replacement is not an option, have no fear. There are many other storm protection options for your sunroom. Metal Storm Panels are one of the best-known and most affordable options. These removable panels provide rock-solid resilience against violent storm surges. Engineered to meet the most stringent wind codes, storm panels are installed on the exterior of your home. They can be installed on permanently mounted tracks or bolted into place. The storm panels are corrugated or grooved in a wavy fashion to allow each piece to overlap the next for maximum strength and durability. This is also helpful when storing, as the panels fit on top of one another and take up limited space as opposed to the traditional use of plywood. Fabric Storm Panels are an inexpensive and efficacious alternative to the hard materials used to construct the metal versions and are quick and easy to install when a storm is fast approaching. This DIY storm fabric can be installed by the homeowner in just three easy steps and are storm code compliant. The storm fabric allows diffused light to enter through the glass, providing an airy feel in the sunroom that the fabric storm panels are protecting. When not being used, the storm fabric is easy to store and takes up minimal space. The storm fabric is surprisingly durable and functional, and are an innovative and convenient way to protect your sunroom. Another reason these are perfect for a sunroom? The storm fabric comes in every size imaginable, so they’re ideal for covering large doors and windows. Roll Down Shutters provide your sunroom with permanently installed storm protection that can be lowered and raised. Built to withstand intense hurricane force winds, roll down shutters are constructed of materials such as aluminum, stainless and galvanized steel. The roll down shutters open and close seamlessly. Due to the incredible ease of operation, these shutters eliminate the need to spend hours before and after a storm handling the window protection. The roll down shutters come in manual or motorized options to fit your needs. 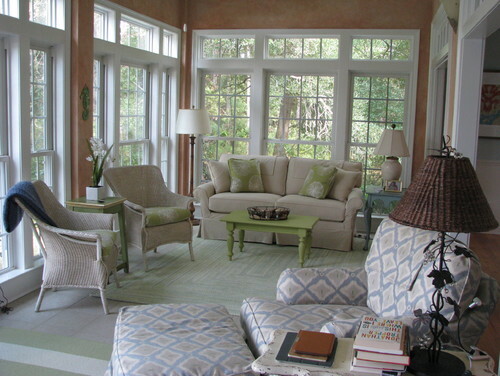 Your sunroom is an integral part of your home. Still not sure which option is best for your sunroom? Call in a Lowcountry Storm Protection Specialist for a free in-home consultation that fits your home and your budget. Have you ever been dazzled by grand-scale windows in places with tall, open ceilings? Was it the natural light streaming in? The feeling of spaciousness? Ambiance? Luxury? Could such a simple thing be yours? Do you know the benefits of having windows in rooms with tall open ceilings? With a historical precedent easily seen in public meeting halls, places of worship, grand homes, hotels, and transportation stations, the innovations in building materials and construction techniques has created the opportunity for the kind of luxury large windows in high places provide. Natural light is one of the greatest benefits of high placed windows. Using natural light helps reduce the overall lighting costs. Believe it or not, windows in high places can also help conserve energy when heating and cooling your home or business. Prior to the advent of air conditioning, high ceilings were, and still are, one of the best architectural features used for interior climate control. Combined with operable windows, natural airflow helped create reasonable comfortable interior temperatures in certain climates. These features are just as desirable today, but there are some important things to know about creating a comfortable interior environment that is cost and energy efficient. One thing to understand is how much direct sunlight the room receives during each season. Which direction do the windows face? Will the sunlight be blocked at any time during the day from another building or nature? A north or south facing window will receive sunlight throughout the day, while east or west facing windows only receive light for part of the day. With the light comes the heat. Any decision regarding large-sized windows or a series of smaller windows means that a room’s temperature is a concern. Big windows can allow for enhanced natural heating, which makes high ceilings a particularly desirable for the circulation of warm and cool air, regardless of the season. This leads to the paramount discussion of the overall energy efficiency of a window. As with any window selection, a window’s energy efficiency relies on its combined components. This begins with the window itself: glass, glazing, frame, and other window parts. Windows, for example, that feature double panes serve many key energy saving objectives. Large double pane windows are more effective at keeping warmth in a dwelling and will prevent cold air from entering the building. Likewise, when temperatures are high and the air conditioner is going, the large double pane windows will keep cool air inside and prevent the outside heat from coming in. Then comes the question of ventilation, or the circulation of fresh air. Unwanted ventilation comes in terms of air leakage around a window, often making the heating or cooling system to work harder. Big windows in high places, however, can be advantageous for ventilation by virtue of the heightened ceilings, which allow for the circulation and distribution of warm and cool air throughout the room. Ventilation also includes the operability of the windows. Whether these windows are operable or not are often at the discretion of the owner. As with the orientation of natural light through the windows, knowledge of typical wind directions may influence a decision on the selection of operable windows. Should you want to be able to open those windows, window experts may recommend the best kind of operable window for space, giving you the ability to control the fresh airflow into the room. Whether it is a single window in the entry hall or a row of windows stretching light into your great room or office lobby, the big, contemporary window designs create beautiful interiors, with enriched views and natural lighting while keeping your interiors comfortable. It is all in the details when it comes to historic buildings. Many people have lived in homes that have been built since the 1950s. Since such time they most likely have experienced a window replacement that included upgrading windows with higher impact ratings to handle potential storm damage. They also may have added shutters as decorative accents to their home to enhance curb appeal. For anyone who has lived in homes or worked in buildings in areas that vigorously support the preservation of historic structures built prior to the advent of air conditioning shutters became a very valuable commodity. Commonly known as vernacular architecture, buildings were often made of materials native to the region as well as oriented and designed to accommodate the local climate. Examples in the Lowcountry include deep west-facing piazzas, large windows, tall ceilings, and shutters. Charleston, South Carolina boasts one such historic district governed by the Board of Architectural Review (BAR) and advised by the Preservation Society of Charleston and the Historic Charleston Foundation. Compared to the challenges of preserving windows or doors in historic buildings, the shutters are often considered an afterthought. As with all aspects of historic preservation efforts, the National Historic Preservation Act recommends the restoration of shutters, with a replacement as a last resort. Unlike windows and doors, however, finding information from the state historic preservation office on historically accurate shutters for your home is much less complicated. As shutters shifted to a decorative rather than practical function, innovations in design, construction, materials and operation declined. Beyond the shutters themselves, the hardware to fasten the shutter to the building and to allow the shutters to function must also meet the historic requirements for restoration and or replacement. Functional shutters help control light, airflow, and the elements when they are fastened correctly to the historic structure. While it may seem arbitrary to some, every single element in a historic building has an intrinsic value not just to the structure itself. Each element speaks to the industry of home manufacture, the adaptation of the populace to the physical environment as well as the social forces that allowed for its change and development. Something as simple as a shutter can block the daylight and allow the cool breezes for someone's afternoon nap, or divert the rain away from the house during an intense storm even today. It is the subtle details such as historically-accurate replacement shutters that will make your historic building stand out and continue to inspire new developments and non-historic renovations to incorporate traditional shutter styles. A room’s lighting is the core of its ambiance. Natural light is a stunning enhancement of your home’s character. An addition of a skylight is a striking approach to achieving a golden glow. The ceiling is the most unused surface in your home, so why not fully utilize an often-forgotten design space? Sun tunnel skylights, variously known as sun or solar tube, light tube, or tubular skylights, are an ideal solution to brightening up your space and increasing the value of your abode. Sun tunnels make the most of the available daylight, capturing morning sun’s low-angled rays and curving them into your home. The redirected rays emit a stunning glow, transmitting more light into the space than expected. Solar tubes are capped by weather-proof plastic globes, with the exterior end acting as a light diffuser. Light is channeled throughout the length of the tube. The interior of sun tunnel tubes is made of polished sheet-metal which acts to enhance the light’s intensity and brighten your living quarters. 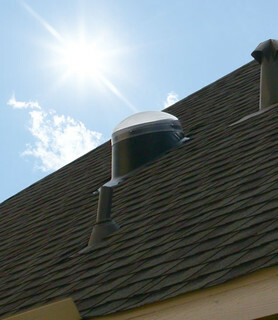 Sun tunnel skylights are more affordable than the traditional alternatives, and help save on electric costs. A 10-inch sun tunnel tube provides light equivalent to 300-watts of electric lighting, and ample lighting for a 200-square foot floor plan; a 14-inch tube will brighten a 300-square foot space. The installation process is rather simple; if you are construction savvy, the DIY route may be for you, if not licensed contractors may be a better fit for your sun tunnel installation. No framing alterations are needed when installing a light tunnel, though there are limitations. Flexible tubing may need to be used, depending on your home’s attic space and ceiling structure. Vaulted ceilings are particularly simple when installing a sun tunnel, requiring only a foot or two of tubing. 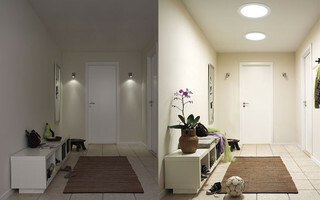 Natural lighting through sun tunnel skylights is a simple addition to lackluster, often over-looked or confined spaces. These luxurious lights are particularly ideal for smaller areas in your home such as hallways, walk-in closets, bathrooms, stairwells, and laundry rooms. They also add incredible character and glamour to well-frequented living spaces that tend to have more natural lighting, such as kitchens and family rooms. The location of sun tunnels in your home may dictate how you arrange your home furnishings, particularly to avoid the glare when watching television or working on your computer. Bathe your home in natural light! Sun tunnels are the perfect addition of natural lighting to your Lowcountry home. Contact the experts at Muhler Windows and Doors for a consultation to integrate more natural light into your home. What is in a door? In particular, the door to your home or business? It is more than just an entry. Your door can reflect your personal tastes as well as make your home or business more appealing to those passing by. Entry doors can create an inviting environment to those who may cross the threshold and may complement the architectural style of your home or business. When you have a registered historic building as a home or business or the building is within a registered historic district, you may be required to maintain the look and feel of the original design of the structure. It is often challenging to maintain historic buildings under current historic regulations as well as upgrading them to current building codes and energy requirements. While windows are often the primary focus in a preservation or restoration project, doors are just as important to maintaining the historical integrity of your building. Just as it is with windows, guidelines recommend restoring your historic door, and only replacing the door as a last resort. As with all historic buildings, it is time to do some research once it is apparent that a door replacement is necessary. You may have options in the historical style of your door, particularly if previous owners had made home renovations that changed the style of the home, making it historically eclectic. For example, the Robert William Roper House in downtown Charleston, South Carolina, was built in the 1830s in the Greek Revival style with deep west facing piazzas to catch the breezes and block the sun. The front door would have been located along the driveway instead of along the street. A later renovation incorporated a recessed yet elegant street-facing entrance. It is noteworthy that this alteration was executed previous to the establishment of the municipal and non-profit organizations created to preserve the architectural heritage of Charleston: the Board of Architectural Review, the Historic Charleston Foundation and the Preservation Society of Charleston. The Robert William Roper House has original door located along the piazza, as well as the modified street entrance. As you research the architectural history and development of your home from archival resources from local and state libraries and preservation societies, you may learn more about the previous owners and glean an insight into how technology and innovation were incorporated into any modifications. With this historic information in hand, your State Historic Preservation Office will be instrumental in helping you or your contractor find resources for your door replacement that meet their regulatory guidelines as well as procedures and compliance for local building codes, special grants or mortgage loans and preservation easements. Since American architecture pulls from many styles and many eras, you may even be able to salvage a historic door from somewhere else to use. More often than not, however, you will have to replace your door. Luckily any of these historic door styles are also very popular with current construction and building trends. Door manufacturers, like Jeld-Wen often create historic door styles with modern building materials as well as creating doors as accurately as possible to meet historical regulations. As you begin to look for a source for your historic door, your Lowcountry window and door specialists will help you find the best door to fit your historic building’s needs. They will also help you navigate the details of general door replacement including door configuration, glass options, panel types, door handing, and door swing. Contact your local door experts at Muhler Windows and Doors for a free consultation to replace the doors of your historic building. Safeguard Your Home! Hurricane Season is Coming! It is that time of year again. Hurricane season is nearly upon us and we have already had two named storms. Living in the Lowcountry means that hurricane season is a fact of life. Some years are quiet, allowing us all to breathe a collective sigh of relief in November. Other times, the Lowcountry has sustained direct hits or glancing blows from major storms including Hazel, Hugo, Andrew, Floyd, and, most recently, Matthew. As we all have learned, the storm is quick, but the resulting effects are long-lasting. One of the most significant dangers from hurricanes and accompanying tornadoes is the danger of the high winds and damage from windborne debris. The sustained wind speeds are measured by the Saffir-Simpson Hurricane Wind Scale in order to calculate potential property damage estimates and to determine the category of the hurricane from 1 to 5. Damage can range from missing shingles, downed trees, and scattered power outages to the complete destruction of homes, bridges, and isolated areas with long-term power outages leaving them uninhabitable. Protecting your home begins with an inspection of your windows, doors, and storm protection. Windows and doors should be air-tight to keep strong winds out. Hurricanes involve strong positive and negative pressure. The positive pressure pushes against windows, doors, and roof from the outside of your home. If this air penetrates the home, the negative pressure then pushes against them from the inside, which can cause wall and roof collapse. Storm protection is used to reduce the wind forces on the windows and doors and to protect them from windborne debris such as tree limbs, street signs, and outdoor furnishings. Impact rated windows and doors feature stronger glass (such as what is used in windshields) that will not break free from the frame. In order to be certified, these products are impacted by a 2 x 4 in testing and then submitted to 900 cycles of positive and negative pressure in order to simulate a hurricane. The International Building Code and other national model building codes have set forth a series of requirements for building components regarding impact from flying debris and cycles of positive and negative pressure (Cyclic Pressure Test). These ratings confirmed by the American Society for Testing & Materials (ASTM) are of utmost importance to areas designated as Windborne Debris Regions. Hurricanes are part of the Lowcountry lifestyle. Contact the experts at Muhler Windows & Doors to now schedule a free consultation to ensure that your windows, doors, and shutters will protect your home and family against the storms to come. Many of us are lucky to live in an amazing place that allow for indoor and outdoor living most of the year. Especially in the Lowcountry, people enjoy all four seasons where the sights and sounds of nature are breathtaking and inspiring. Whether spring, summer, winter, or fall, the outside world is mysterious, beautiful, and inviting. Sometimes we want to create a seamless transition between our interior and exterior spaces. Sometimes we want those partitions to be definitive and yet complement both spaces. Stylish patio doors fills this need. With the variety of options available, we often need experts to help us create and express a personalized vision that reflects not only our lifestyle but also the personality of our homes. While interior designers and traditional home improvement companies can often guide your design and selection; consulting with window and door specialists will give you more knowledgeable insight into choices that have been developed to suit the region. Trends in the renovation of older homes often follow the trends of creating more open, inviting spaces found in new construction. With the light coming through patio doors and windows, you are invited to go outside and smell the fresh air, maybe jump on the swing, or lay on the hammock. Even if you stay inside, a bright open interior space gives you a feeling of being free from constraints and ready to tackle your daily challenges. With the right patio doors that incorporate full glass and partial window openings, you may be enticed outside by the birds, butterflies, mischievously scurrying squirrels and many other beauties of Mother Nature. The patio doors can let in wonderful breezes, smells of fresh rain or cut grass, sounds of singing birds, chirping crickets and cicadas, rustling trees, the sight of falling leaves, pollinating bees. Larger patio doors allow the homeowners to blur the line between inside and outside which creates the feel of a larger living space. Showcase your backyard escape or stylish outdoor kitchens for entertaining seamlessly while enjoying the Lowcountry sights and sounds. Whether you are inside or outside with partially open or completely closed patio doors, you need the right transition. Attractive, sturdy, and functional patio doors are the key to inviting more of the outdoors into your home. Contact the experts at Muhler Windows and Doors to explore the variety of stylish patio doors that fit your home, your personal tastes, and your budget. What do you do when you want to expand the interior of your home and maintain a functional outdoor entertaining space? You add a sunroom and a deck, of course! Now, you may already have a deck. If you do, then it’s time to explore converting part or all of it into a sunroom, as well as expanding the actual deck space. The first step is to decide what your want. How will you use your sunroom? Year-round? 3 or 4 seasons? Will it be an extension of your home, or an added outdoor room? Will you take advantage of your local climate with operable windows? Will you be incorporating electrical, plumbing, or heating elements? Will you want lights, a sound system, television, ceiling fan, refrigeration, a bar, a sink, or a separate heater? What about your deck? Will it also be an entertaining or relaxing space? Will it be part of your grilling scene? The second step is to contact your reputable company with professional knowledge about porches, outdoor structures, decks, and conversions. The best company will develop a detailed structural drawings, guide you through the process of product selection, and help you with the overall building process, as well as provide very specific pricing based on your choices. If your sunroom company only does the design, your next step will be to engage the services of a professional contractor, who will be knowledgable of local building codes and how they apply to your home. Oftentimes they also work with licensed plumbers, licensed electricians, and local building inspectors. A sunroom with a deck will give you greater versatility in your entertaining and relaxation. You’ll have a place to grill and keep potted plants. Your sunroom will allow you to enjoy your backyard escape even in inclement weather due a random summer rain shower, the sweltering sun, or the incessant mosquitos. Contact your sunroom experts, Muhler Windows and Doors to discuss your deck and sunroom outdoor escape combination.